Hope all is well. As mentioned in my last post, I’m working with rough footage from episodes 1 and 2 of this webseries I’ve been asked to score. Watching them daily is a habit I need to adopt, as it will surely allow me to develop a “oneness” for composing the right music – something that I think is more at the forefront than any other aspect of this. So, the tools, what am I using? My digital audio workstation (DAW) is Logic Pro X. I’ve been using Logic since v7 (Logic Express 7.2, to be exact) and never looked back. it wasn’t until I got Logic 9 that I started doing minor video scoring (short movie of Vine time-lapsed clips I put together for a track I composed). I need to get up to speed on Alchemy. this fantastic new synth that is now part of Logic X as I hear it has some good sounds that lend themselves to movie scoring. As for plugins, I use a number of Native Instrument products – Maschine, Massive, Komplete Select, and now Evolve Mutations 1 and 2, recently cross licensed to Native Instruments for purchase. The bundle has always been popular for movie scoring, specifically science fiction and action-type scenes, but its flexibility allows for it to exceed that. NI recently had them on sale a few months ago, so I thought it’d be a good first investment to use in the scoring arena. To date, I have one idea complete for the series’ theme music – that track will lie over the series title sequence. It surprisingly came quicker to me than I thought, so I’m kinda amped about that. I got the nod of approval from my SRRC (Senior Resident Creative Consultant aka wife LOL). My JRCC (Junior Resident Creative Consultant aka daughter) will be home from college next month, so I’ll have to see what she says…LOL. After this second idea is done, I’ll transition back to working on the bridging music for both episodes as that music are just ideas in my head, notes in the studio log so far. I hope I can transfer what I hear in my head to a listener’s ears. We’ll see. That’s about it for now, time to get back to it. Greetings readers, thanks for stopping by. This is the first of many planned posts that I’m sharing with you regarding my foray in to film scoring. I ope you come along for the ride. Most of you reading this post already know me as a musician, composer, songwriter, producer and home studio owner (for those of you that don’t, check the About Me page here on my website). That said, I’ll start this debut post with some back fill as to how I took the first step on this journey…bear with me. My first steps (or should I say crawl) took place about two years ago. My cousin asked me to score a 10 minute film that he and his friends shot. This film was to be submitted to an international film festival. I jumped at the opportunity because I had never done music-to-film before and figured, “Why not? It can’t be that hard”. After I started I found the complete opposite to be true. Couple that with the fact i was unemployed and constantly looking for a main 9-5 again, it didn’t work out. Fast forward to last year, my current PR gal, Felicia Hodges, turned me on to her cousin, who happens to be a screenwriter that has heard my releases and work in progress tracks on my Soundcloud account. Next thing I know, I’m being asked to score the music for her webseries which is already in production. I, being in a better space than I was with my previous try, jumped on it again. Doing so made me realize that, despite getting another crack at this, found it is no more easier than it was before. 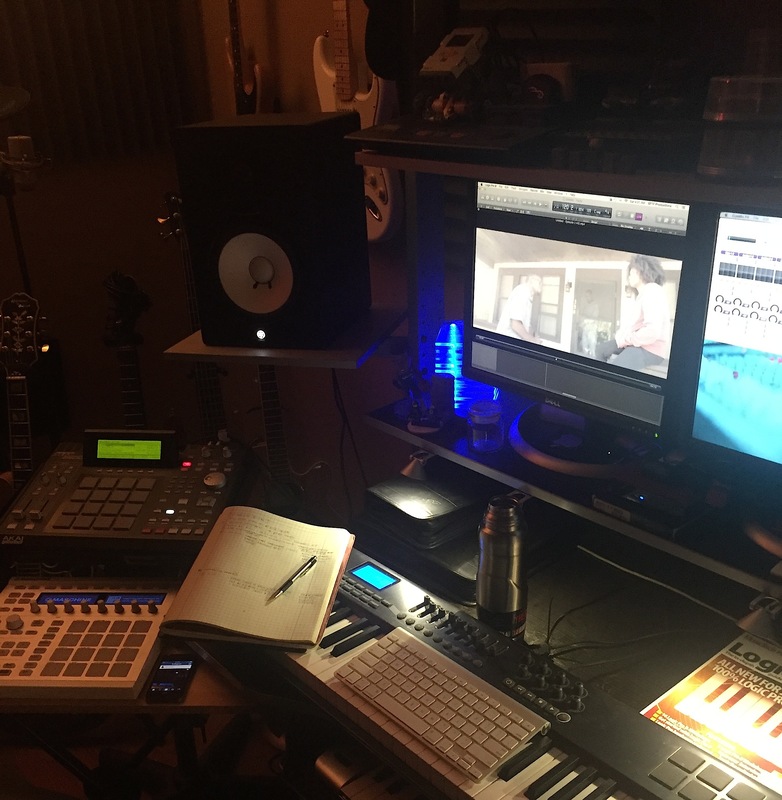 Scoring music to film is not like writing and producing music for yourself. That music for the film must be synergistic with the visuals that lie atop the music, so it helps convey the story in the way the screenwriter intends, as well as delivering the essence of what is going on at every place music is used to convey whatever is meant to be conveyed. That is no easy feat, but I have been told by mentor to “make it fun and enjoy what you’re doing: (more on him later). In these posts, I’ll go in to some detail about the composition tools I’m using (my music production friends will love that), as well my own feelings. I’m excited but I admit my confidence level is not where I wanted to be yet …guess I need to correlate this to learning how to ride a bile – gotta start off with training wheels. Last night I completed the first musical idea for the aforementioned title sequence and have an idea for another. My in-house creative consultant (bka wife) likes what she’s heard so far for that. As for the bridging music for the first two themes, I’ve got detailed notes written down in studio log…..let’s see if I can translate what I hear in my head to what everyone else will hear (and see) for the video. The challenge begins. In the next post, I’ll elaborate a little more on what’s been done and how, as well as the tech side of what I’m using, tool wise. Thanks for bearing with my “long windedness” and thanks for the read as well.